what day would you like to pick up your order? what day would you like your delivery? *we will be baking cookies soon! delivery is provided by messenger service. please see delivery rates for pricing. does it have to be there by a certain time? Enjoy a $10 gift card and a secret recipe download when you pre-order today! Get your oven fired up and your whisk twirling... 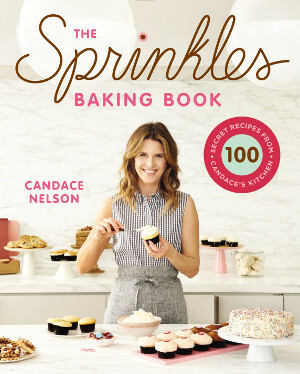 The Sprinkles Baking Book is loaded with over fifty of our best-kept secret recipes as well as Candace's all-time favorite dessert recipes for cakes, pies, quick breads, cookies and bars and recipes from Sprinkles friends Reese Witherspoon, Julia Roberts, Michael Strahan and Jessica Alba. *Your order may take up to 10 days to arrive.